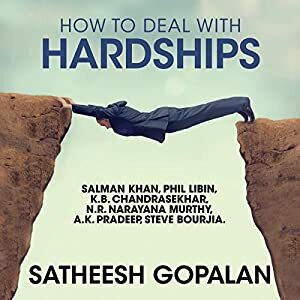 This audio program takes listeners on a worldwide journey to show how great achievers deal with hardships in a hypercompetitive world. 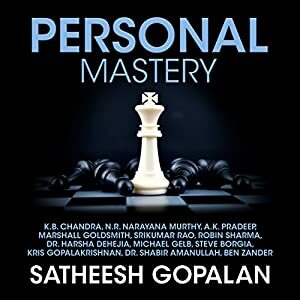 These contributors include Salman Khan, Phil Libin, K. B. Chandrasekhar, N. R. Narayana Murthy, A. K Pradeep, and Steve Bourjia. This audio program takes listeners on a worldwide journey to show how great achievers use creativity, innovation, and technology to start businesses that thrive in a hypercompetitive world. 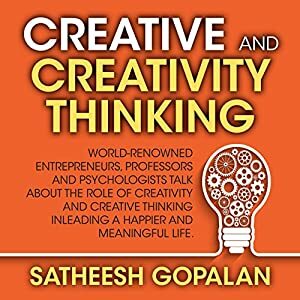 Some of the greatest innovators of our time, like A. K. Pradeep, Phil Libin, N. R. Narayana Murthy, Steve Borgia, Ben Zander, Dr. Harsha Dehejia, Dr. Shabir Amanullah, and Mihaly Csikszentmihalyi, discuss creativity and creative thinking. 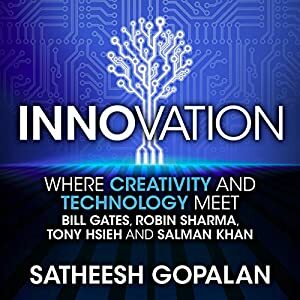 This audiobook takes listeners on a worldwide journey to show how great achievers use creativity, innovation, and technology to start businesses that thrive in a hypercompetitive world. 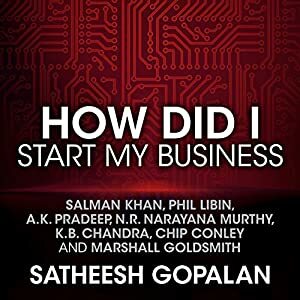 Some of the greatest innovators of our time, like Salman Khan, Phil Libin, A. K. Pradeep, N. R. Narayana Murthy, K. B. Chandra, Chip Conley, and Marshall Goldsmith discuss how they started and offer listeners advice and encouragement. Innovation: Where Creativity and Technology Meet is a documentary about creativity, innovation, and technology. This audio program takes listeners on a worldwide journey to show how great achievers use creativity, innovation, and technology to thrive in a hyperconnected and hypercompetitive world. Some of the greatest innovators of our time, like Bill Gates, Salman Khan, and others, make listeners feel that they, too, can become great, and it is never too late to become the people they want to be. Success. It means wanting something so grand, and finally taking it. But for young women, this wanting goes hand in hand with doubt and fear. Making it in High Heels addresses her inner voice that says, "I'm not good enough." It celebrates how successful women are able to tame that inner voice, and ultimately transform it into, "I am worth it! I can do this!" This group of superwomen do not only achieve success in their careers, but also have the confidence and desire to help causes close to their hearts. Discover how each woman's journey takes her to success, and the drive that pushes her to do even more. 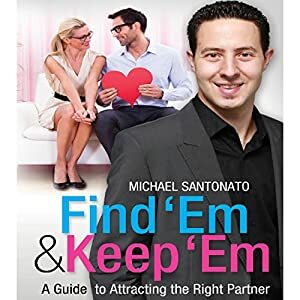 Find 'Em and Keep 'Em is not about dating. You've got enough books and blogs for that. Instead it is about getting to know yourself, what you want, and what you have to offer within a relationship. By mastering who you are and what is at play in the dynamics of attraction and magnetism, you will be able to understand why you haven't had those great partners and relationships in the past. And how you can start to have them now! "There is no reason why someone can't be in a fulfilling relationship with someone he or she loves." It's about becoming the kind of person who can be with anyone you want to be with and naturally attracting him or her in record speed. This audiobook is essential if you want to get off the fence and get into a great relationship! 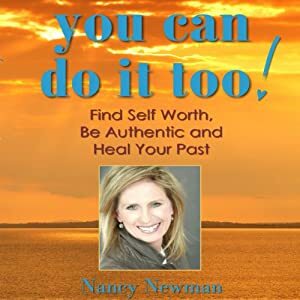 The book is filled with exercises and insights to help you let go of limiting beliefs around yourself and relationships. It will help you reach new perceptions and take new actions you never thought of in the past. Michael takes the method he's been teaching people all over the world to attract great partners and proves its truth, giving you easy access to using it immediately. Attracting that great partner into your life will be so easy, you'll never have to wonder "how" again. Even the most conservative women have a naughty side to them. To see it you have to communicate and make them feel comfortable. Brandi Love can tell you what women want to hear and what to do to get them to go wild on you! The diagnosis of cancer can be the scariest feeling in the world, but for some, cancer can be your greatest teacher. For Pasty McLean, having cancer exposed her to a new world of education - from nutritional deficiencies and exercise to the importance of mind-body balance. 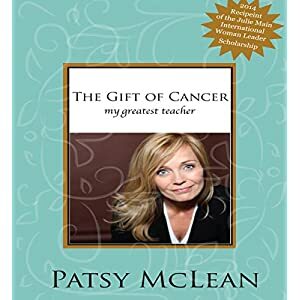 Researching how toxins affect the body and how nutrition can work to benefit or cripple our immune system, this book will go through the journey of how Patsy beat cancer and evaluated her life and values. Facing death was not a death sentence but rather the start of a whole new life! Patsy is the 2014 recipient of the Julie Main International Woman Leader Scholarship. With bullying and suicide becoming a prevalent issue for young girls, the need for mentors is stronger than ever. Making it in High Heels brings together women from all different backgrounds and careers, providing advice, inspiration and motivation through personal life stories about the ups and downs of life and lessons in perseverance. Making it in High Heels dares women of all ages to be inspired and motivated, not only to better their lives but the world as a whole. A guide to the modern woman on finding the rules to living a sweet life by being fierce, confident, and by believing in yourself. Hoping to help inspire woman and men on finding inner peace, trusting your intuition and going after what you want. You will be taken on a spiritual journey onto different ways of looking at life. A series of life stories that will help find meaning to life, motivate those who want to give up, and inspire others to always do better. It gives you insights on friendships, love, spirituality, and motherhood. A self-help audiobook like no other. From the author of the best-selling Hard Time, and seen on Locked Up Abroad, Shaun Attwood took his business degree to Phoenix, Arizona, where he became an award winning stockbroker and then a millionaire day trader during the dot-com bubble. But Shaun became greedy and lost sight of what was important. He threw raves and distributed Ecstasy grossing $25 million. Before being convicted of money laundering and drug dealing, he served 26 months in the infamous jail system run by the notorious Sheriff Joe Arpaio. Lessons from a Drug Lord is his account of the time Shaun spent submerged in a nightmarish world of drugs and gangs, insect infested cells with food unfit for animals and the lessons he learned from his choices. His teachings will force you to re-examine your life and what is truly important. About 7 million women suffer from an eating disorder. By the age of 20, Paula Galli was descending into a personal hell - forever obsessed with food, body image, and her weight. Life became a nightmare of deceit, sadness, and self-hate. In Weighing Love, she analyzes through personal experiences overcoming her damaged self-image to help others learn how to rediscover their sense of self. With practical advice, encouragement, and exercises her no-nonsense approach is a must-hear for women of all ages! Everyone remembers where they were during the September 11 attacks in New York. Larry Garrett, a Chicago hypnotist, will never forget, since he was in Saddam Hussein's palace in Baghdad with Uday Hussein, Saddam's eldest son. After an assassination attempt on Uday's life, Larry Garrett was brought in to help with the recovery from the mental and physical pain. Larry writes about his account of dealing with the man often referred to as a psychopath, the CIA, a palace full of guards with machine guns, and visiting Babylon. The conversations about American culture and Uday Hussein's very surprising views, to getting the behind the scenes account at the palace as a World War begins. Larry's account of being the only American allowed into Iraq and hypnotizing the son of the most feared family in the World, will keep you in suspense. Larry Garrett has been in practice since 1968, operating the largest hypnosis centre in Chicago. He has received nationwide recognition for his outstanding contributions in hypnosis, including the 1991 Metzinger Award (which has only been presented six times) for contributions to the field of hypnosis. This successful businesswoman's guide shows how to help women of all ages seize control of their destiny. Kirin doesn't only focus on business, she teaches balance by teaching how to make friends, how to find your passion and career path. 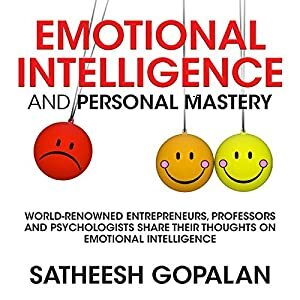 This hard-driver author suggests that her listeners ought to never get emotional when dealing in business, as it clouds the judgment and hampers the results. Find the right sales technique for you and mold it to suit you. Written by a woman, to women, she tackles the issues of culture and managing the expectations of others. She gives advice on how to overcome both personal and family issues. She presents techniques, such as surrounding yourself with only positive influences in order to enhance positive energy and attitude. She proves that every woman can accomplish their goals, attain worthy income, raise a family, and have it all. We all have wondered if we are being told the truth. Well now you no longer have to wonder. Success requires trust in those who surround us and they are speaking to us without even talking, if we know how to read the signs. Three quarters of our communication is non-verbal. Reading Everyday Body Language contains scientifically proven psychological techniques that can be applied to all sorts of everyday situations. Determine if a person is being honest, whether your date likes you or not, and how to know if someone lacks confidence. In this practical guide, author Sanjay Burman teaches us how to read body language and micro-gestures. He explains the meaning of a scratch of the chin, the wringing of hands, a wrinkle of the nose or a hard swallow. With these techniques the listener will be able to uncover the true meaning behind these and other gestures to confirm what others are saying, and of their truthfulness. Learn how your body language reading can be used to persuade people to buy your product, vote your way, or believe what you want. The benefits to understanding body language and how it can be used to persuade people are limitless. It will increase your commissions, help you communicate more effectively with others, and understand the truth behind people's words. Don't be a Donkey is a true story about the life and career of Chef Chadd McArthur. It is about the lessons, about both kitchen and life, that he learned while working for Gordon Ramsay. Eighteen hours a day, five days a week...when you work with a great chef and leader that much, his wisdom will rub off on you, and at times traumatize you. The lessons learned will stick with Chef McArthur for the rest of his life, and now, with funny stories and clever insights into working with one of the world's most well-known chefs, he's sharing them in this very audiobook. From having Chef Gordon Ramsay himself fling a ravioli at him, to the integrity with which Ramsay dealt with the death of a colleague, Chef McArthur has a lot to tell about his three years spent working in Ramsay's flagship restaurant in London, sometimes directly under the man himself. Each chapter also includes a recipe, some created wholly by the author, and some influenced by Chef Ramsay's own signature dishes. Enjoy this fresh new take on Gordon Ramsay, and the challenges of a chef who survived Ramsay's kitchen for years. From writer to producer and speaker, Elizabeth Gaylynn Baker lives an interesting and creative life. From celebrities, spiritual leaders to Yogi's, she has been mentored by them all. As times become more uncertain, many great minds suggest we must change our thinking if we want to continue to exist as a species. This collection of sweet stories will share wisdom and wit and allow you to live outside of fear. "One day, one of Bozana's Skojo's friends told her she was 'a good poor'. Bewildered by the words at first, Bozana gradually came to realize they really did describe her - someone who was never overcome by adversity, but who fixed up her hair, put on a little lipstick and her 'game face' to work her way out of any difficulties that fate tossed her way. She realized it was a strategy for living that could apply to any situation. In Don't Get Mad, Get Successful, Bozana shares stories from her life and talks about how she did overcome the difficulties, the ups and downs - the loss of a parent, professional, and personal betrayals - to emerge as a successful business owner and loving mother of a wonderful son. Her story illustrates a host of practical life lessons. What if there was a secret city at work on finding answers to the survival of humanity? Technologies beyond your imagination. A city expanding, recruiting, and evolving. There is no government, no money, no bosses, institutions, cars, or roads; and age takes on new meaning. This "facity" is one big research product in and of itself, and nothing else quite like it exists on this Earth. This is the city that Erwin Sharp and his family are drawn into on the fringes of a national park. They fall headfirst down the rabbit hole into a world of space probes, cancer cures, and a core myth that defies belief. They soon realize that some doors are only meant to swing one way. This is a parable of trust and hope - a flashing beacon of hope in a world hell-bent on destroying itself. It is ultimately a story of ambition, of owning up to life, showing up and trading up. In a story that is as controversial as it is reassuring, sometimes it is possible to find something you always hoped existed, and in finding it, you confront our own truth as much as that of the world you live in. What is inside the mysterious Hall 8, and what does that have to do with Erwin? And how is water the mechanism of peace or destruction? Thick with adventure, revelations and twists, this story shows how what we accept is only that which we've been conditioned to accept, and why an ancient Mayan prophesy doesn’t actually mean what you think. Closing the Deal is a handy tip book for anyone looking to buy, rent or sell their place. With tips that others won't share with you, Al gives you advice and ideas to educate you on how to get things done effectively. For instance, baking cinnamon buns before you have an open house gives your property a very pleasant and homey feel. Home staging for cheap can get you more money for your property, and having bad credit, doesn't mean you can't get a mortgage! Al will take you through the DOs and DON'Ts of buying, renting or selling property, including what to be aware of when looking for the best real estate agent.